Joshua Graham is an excellent Demon Hunter, but over-using his powers cost him dearly. This isn't my art, and I'll take it down if asked. He is covered by bandages, some bloody and the skin that is visible is charred. He wears a leather Duster and some field pants. Under his duster he waears a white shirt with splotches of blood. He had a wife before he was assaulted and left for dead. Law School, hand weaponry training. The Burned Man drank the water very slowly, as if savoring every drop. The Boiling Deserts didn't see much rain during his stay there. In fact, it never saw any rain. ever. The Burned Man slid out of his stool and shuffled slowly across the bar. His boots clunked on the floor and a large hole in the top of one of them allowed a good look at his burnt foot. He sat a short distance from Zeke and Stryfe. He slowly continued to drink his water. The Burned Man finished his water, and slid his hand into his trench coat. He wrapped his hand around his lucky revolver and sighed. He could feel the cool metal through his bandages, and it felt good. He watched the mercenaries stand up and get ready to fire or shoot. He hated shoot outs, and he'd probably get shot again, but he's normally pretty lucky with the whole getting shot thing. He didn't want to start anything though, so he'd wait for the fight to begin before he joined. Unless it didn't start, then he'd let go of his weapon and go get more water. The Sun beat down on the destroyed vehicles and skeletal remains of long dead soldiers. The sand shift uneasily under Doree's feet, and was obviously movable. Several just fading foot prints where visible snaking around the ruined things. Little did most bystanders know, the sands where cross-crossed with hundreds of trip wires which where hooked to the pins of grenades. Whoever lived here didn't want anyone coming near his home, or at least his hovel. If the girl looked in front of her she'd see a blood spattered sign that read, "Keep out." Below the sign laid a rotting corpse of what looked to be a mercenary or a soldier. The Burned Man awoke, and sat up. He grasped at his bandaged side and grunted, "God dammit." He said under his breath as he stood up. He slid his jacket on lazily, and slid pistols into his waist holsters and thigh holsters. He walked past his crashed humvee and then noticed the girl. He stepped back to where she wouldn't be able to see him and watched her blatantly disregard his sign. He coughed quietly, and started walking towards her, "Who are you?!" He shouted, his voice sounding gross and grizzled. The Burned Man continued to aim the gun at her, "Who are you!?!" He shouted again. He aimed down the sights, and squeezed the trigger again which sent another bullet into the vehicle next to her. He didn't often see people out here in his town. Or what he liked to call his town. He cocked his head to the side and waited quietly for her answer. The Burned Man stepped back but continued aiming, "You are in my place!" He shouted, his voice sounding full of some gross phlegm. He grunted and then holstered his weapon. The girl didn't look too dangerous and he didn't want to kill anyone yet. The Burned Man sighed, "What are you here for?" He asked, quieting down. He noticed her burned clothes, "Do you need some new clothes or something?" He joked, attempting to grin. The Burned Man chuckled, and turned a corner. The rusted vehicles had words written on them in blood or some other dried markings. One said Saloon, while another said courthouse. In the back side of "town" was a flipped over humvee with the top ripped off and made into a covering. A small rock with the words, Joseph's house on it sat next to the car. He sat down in the dust and slid back into his car. "Home sweet home." He sighed. 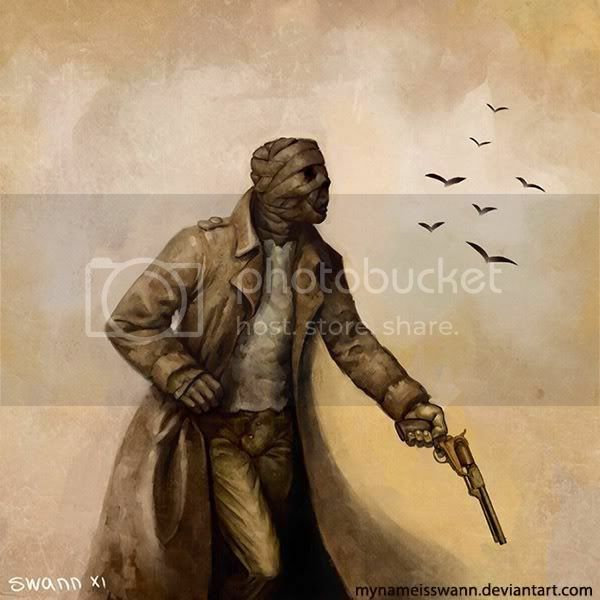 The Burned Man slid his gun out, and turned quickly when the man spoke, "Who are you!" He shouted, firing a shot past the man intentionally. He hated surprises, and with three people, that meant a busy day for the town and so he'd have to be on guard for any mercs how're coming to hunt him down and finish him off. He was attacked a month ago by men claiming that he was Joshua Graham and that he was supposed to be dead, but he isn't Joshua Graham. He's The Burned Man, or at least that's what Jim down at the Saloon calls him. The Burned Man shook his head, "No, we've got plenty." He hated hand outs, and besides, they did have plenty. He had scrounged around in the wastes for days to find as much food as he had now, so he wasn't gonna take any from other people, knowing how hard it was to find. The Burned Man chuckled to himself, and stood. He looked around and then departed for the saloon. He had placed all of his water containers and any other beverages he had found while scavenging inside of this building that was made of two crashed tanks with a large carpet tied to make a covering in between them. He opened a canteen and poured it into his scarred mouth. He felt the cool water run down his throat and when he was done, he closed the bottle and stowed it in the bag where he kept the drinks. He then noticed the young man aiming a gun, "No, no shooting in the town!" He said, tossing a rock at the helicopter. He didn't care if he shoots in the town, but when anyone else does it then that's obviously going to show bandits where they were. The Burned Man froze, and threw a water bottle at the man, as it flew through the air he pulled out a pistol and shot it. The water would spray on the man unless he dodged the water. He then aimed directly at the man, regardless. Too many people, too many people. He then sighed, "What are you doing here?" He asked, his weapon trained on the man's chest. He realized that he's had one to many guns pointed at people today and that if anyone else shows up then he'll have to shoot them. The town was getting restless, and Wilma was asking too many questions. Joshua rested against a boulder, and coughed a little. Some blood stained the cloth bandages beneath his lips as he coughed it up. His whole body was covered in bandages due to the intense scarring, and burning that he'd obtained from over-using his powers as a Demon Banisher. He pulled himself up, and eyed the pentagram that was charred into the grass on The Bluff. It'd been a long fight, but he'd finally been able to banish that demon. Luckily, before it hurt anyone. He took a step to leave, but had to catch himself on the boulder. He needed a bit more rest. Joshua coughed again, "I'll clean it up, I swear." He chuckled, breaking into another fit of coughs. He emerged from the shadow of the boulder, and would be completely visible. Some of his bandages were torn from the fight, and underneath them were deep scars that seemed to glue a slight blue-ish. "The name's Joshua." He said, holding out a bandaged hand. His eyes looked into hers, and his pupils also glowed a light blue. Joshua smiled, "I suppose so. I'm a demon banisher, and the markings sort of come with the banishings." He chuckled, looking down at the markings. He had never really had time to look at the markings, just to stumble away after a fight. His teeth were surprisingly white for being covered in bandages, but all of the energy that he emitted actually vaporized most of the bacteria in his mouth. "What brings you out here, Catherine?" He asked, his voice a little hoarse. A crow flew down, and perched lightly on one of the boulders. It eyed Catherine, and then looked to Joshua. The man smelled dead, but he wasn't. What a shame. Joshua shrugged, "Banishing is what I was born to do. I used to have some markings that showed it, but those are long gone." He said, patting his arm. His skin was all charred, and cracked from the energy that Banishers used being heavily volatile to themselves. "That's a pretty good reason, I suppose. Just to get away from it all. I wish I could do that." He muttered, bracing himself against the boulder. The crow squawked loudly, and then flew off. Joshua watched it fly away, and chuckled, "I think I should hire a professional scare-crow." He shook his head, "Not rotting, just burned and cracked. I'm not dead yet." He chuckled. Once he'd reached a certain point, he'd just gone up in flames. They burned for a day, and half way through the night until he was left like this. A charred shell. "Then who'd stop the demons from systematically blending in, and taking over Wing City? No one. At least that's how we see it." He said, looking out towards the lights of the city. Joshua wasn't a hobo. He had a nice home in the Gambit's Hotel that he lived in. Though sometimes he had to stay away from home for days when the demons came in droves. Joshua shrugged, "Well, we emit a pretty powerful energy that is pretty volatile to demons. Though, it's also pretty bad for us if you haven't noticed." He chuckled, pointing at a spot where the bandages were torn. There was a deep scar running down his arm, and a strange blue glow emanated from it. He let out a sigh, "Well, my organs are pretty much useless besides my heart and lungs. That makes me look a little sickly." He said. The energy pretty much made him self-sustaining. Joshua raised an eyebrow, "Well, it'd be best just to kill the demon. Unless you wanted the demon alive, then you'd need a certain ritual I think." He said, shrugging. He wasn't much for rituals, but he knew someone that was. Nathan, another demon hunter, lived next door to a man by the name of Lucas Whitt, and Lucas was on the up-and-up when it came to rituals. "I know a man you could talk to if you want to go about the safe-way." He said, pulling out a little note-pad. It was mostly covered in scrawled markings and runes, but he tore a blank page off and prepared to write down the address. Joshua pressed his finger onto the paper, and it blackened the paper lightly as he wrote. "His name is Lucas Whitt, he lives on the tenth floor of Gambit's bar hotel." He said, holding out the paper. He had no idea that Catherine already knew Lucas. He shrugged, "I'd just take the demon, and banish it. Effectively sending it back to hell. The ritual would either force it to latch to another being, or it'd become it's own being. It all depends on the demon's will power." He said, quickly pulling his arm up to cough into his elbow. Joshua shrugged, "Sorry, if you need any help, there's a banisher that lives next door. That is, if you decide you'd rather just kill the damn thing." He said, chuckling. He obviously wasn't a big fan of demons, but what could be expected from a man that had gone his whole life killing them. The man felt a light tingle run up from his toes to his head. A demon just arrived somewhere on Terra, and he'd need to go deal with it if the tingling developed any more. Joshua entered first. He was completely covered in bandages, but wore an undershirt and pants as if it were just his skin. He was followed by a well dressed gentleman with short black hair, and a suit with the sleeves rolled up. The group's third was the strange biker-looking man with the two colored eyes. "I hate to come at such a late hour, but me and my associates have a problem that we require some more... I'll say professional assistance." Despite his rather ghoulish appearance, the bandaged man seemed rather civilized and polite. As he spoke, the other two just stood behind him and nodded when he mentioned their need for assistance.